Selene | "How Would You Fix...?" 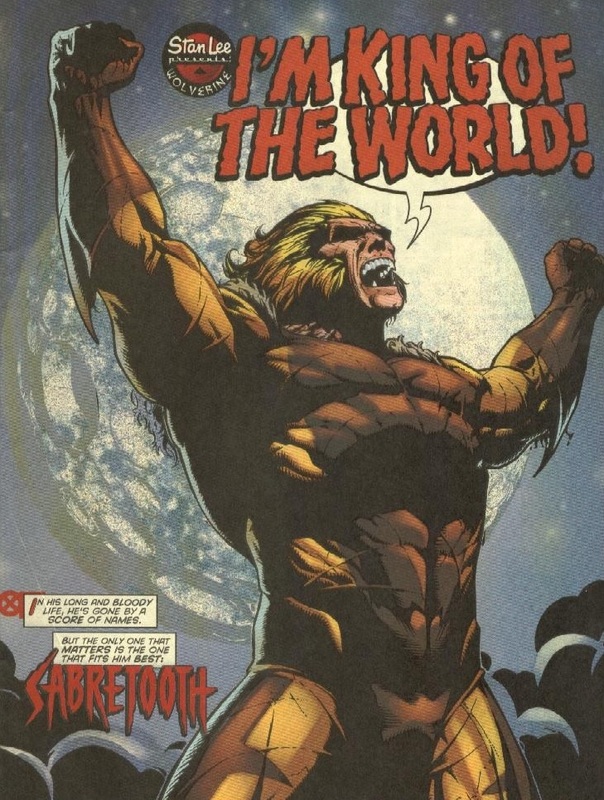 Mister Sinister debuted in the title Uncanny X-Men, first being briefly mentioned by Sabretooth during the Mutant Massacre crossover as the leader of the Marauders who had sent them to slaughter the Morlock population. 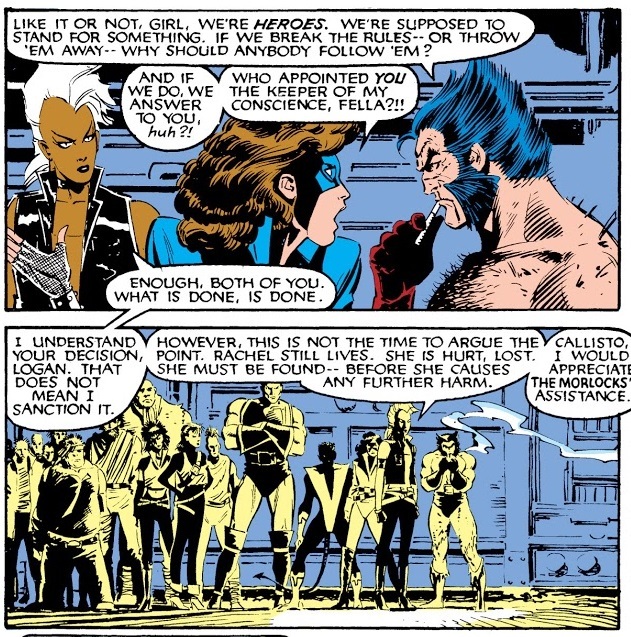 In the following issue, the X-Men member Psylocke picks up a shadowy mental image of the Marauders’ “Master” from Sabretooth’s mind. 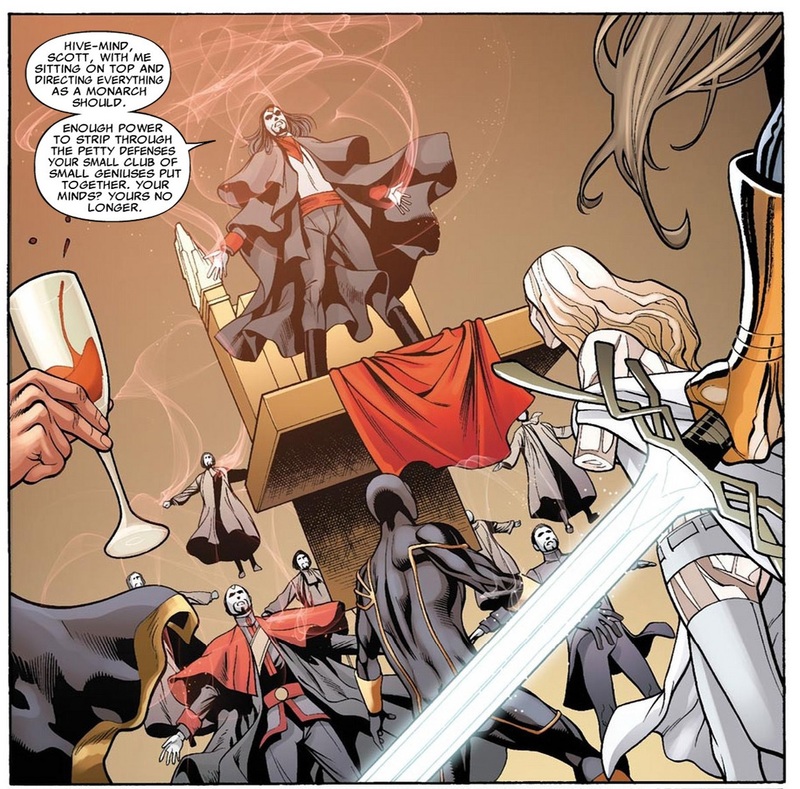 Mister Sinister finally appeared on-panel in issue #221. 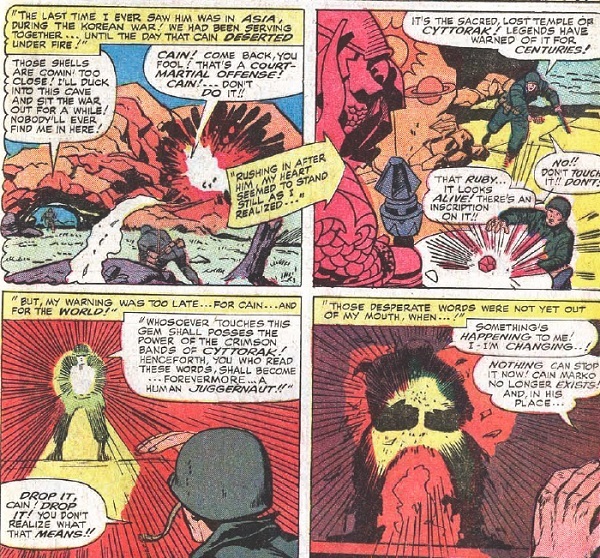 The character plays a major role in the Inferno crossover, where it is revealed that Sinister cloned Madelyne Pryor from Jean Grey for the purpose of having her conceive a child with Cyclops, their son Nathan; Sinister also reveals to have manipulated Cyclops’ life since early childhood. 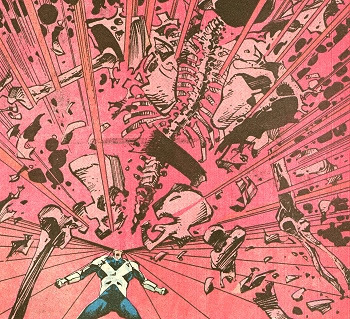 After a battle with the X-Men and X-Factor, the villain is apparently destroyed by Cyclops’ optic beam. 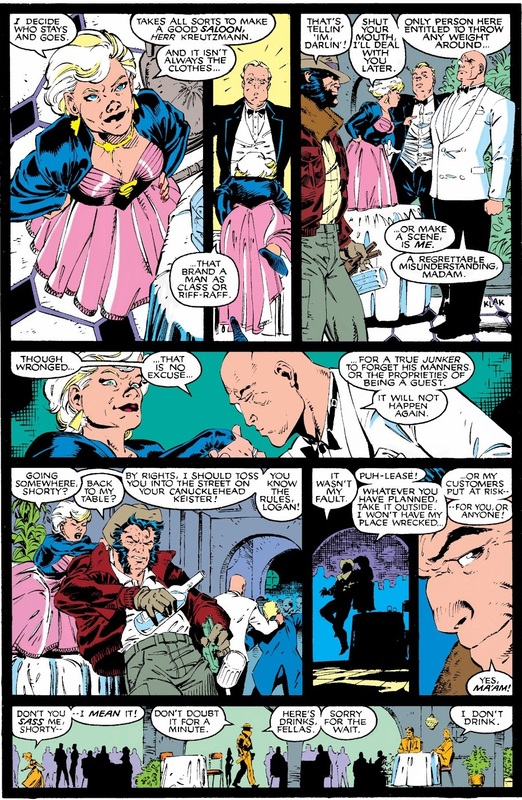 Months after Mister Sinister’s apparent death, Claremont pens Classic X-Men #41–42 (December, 1989) detailing the role he played in Cyclops’ life at the orphanage in Nebraska where Scott was raised. 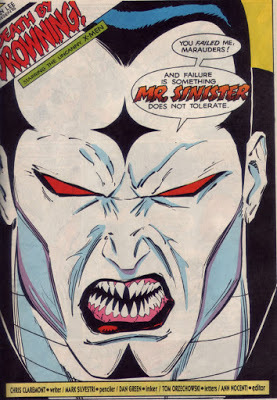 …and whom Claremont intended to actually be Mister Sinister. 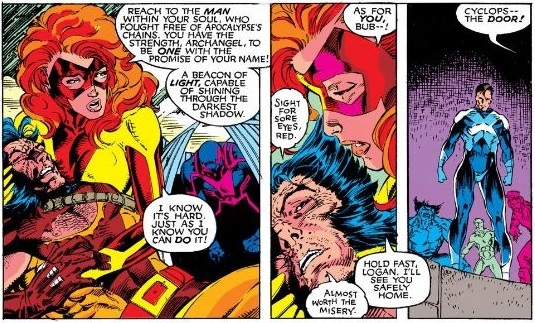 …that eventually turned sour, prompting him to work behind the scenes where he manipulated the creation of Cyclops’ son Nathan (who became the time-travelling soldier Cable) to destroy Apocalypse. A further layer to this origin was added in recent years where we discover the reason he made his initial pact with Apocalypse was to gain knowledge which would enable him to merge with the Dreaming Celestial and use its power to turn hundreds of thousands of people into doppelgangers of himself as part of a plan to bring about “Alpha Day” early whereby the Celestials would return to Earth, eradicate all life, leaving only his perfect clone-race to rebuild the planet and become its dominant species. And fans had the audacity to accuse Claremont’s initially proposed origin as complicated!? 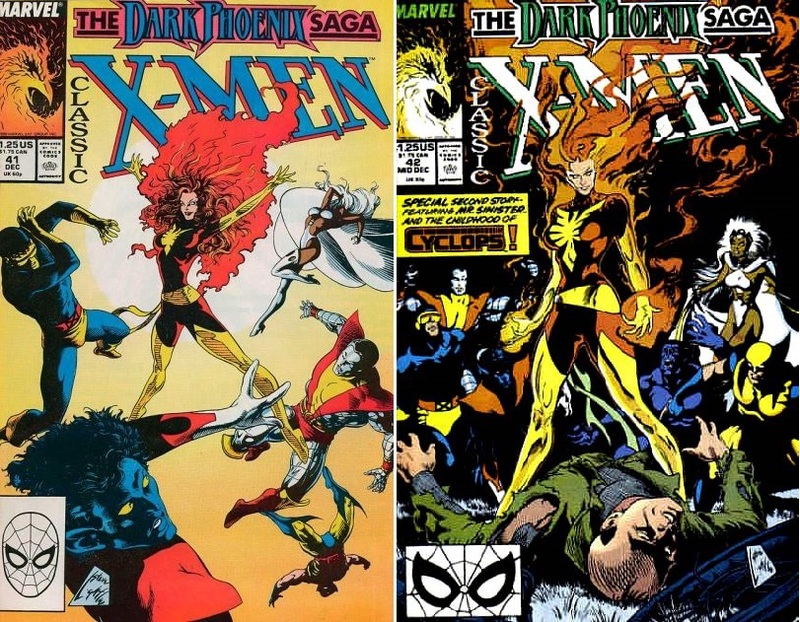 Okay, so let’s go back and delve a little further into Chris Claremont plans for the character. “Dave Cockrum and I were over ideas and what we were coming towards was a mysterious young boy – apparently an 11-year-old – at the orphanage where Scott (Cyclops) was raised, who turned out to be the secret master of the place. 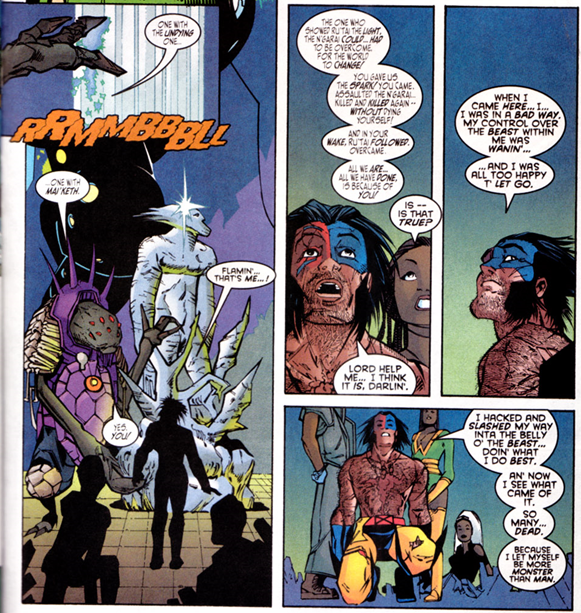 While this addresses his origin for the child-like mutant (Nathan) who is obsessed with Scott, he is appropriately vague in the abovementioned Classic X-Men story with regard to Mister Sinister, such that nothing presented in those issues appeared to get contradicted too much by how later writers went on to develop him. Or so it would seem at a cursory glance! 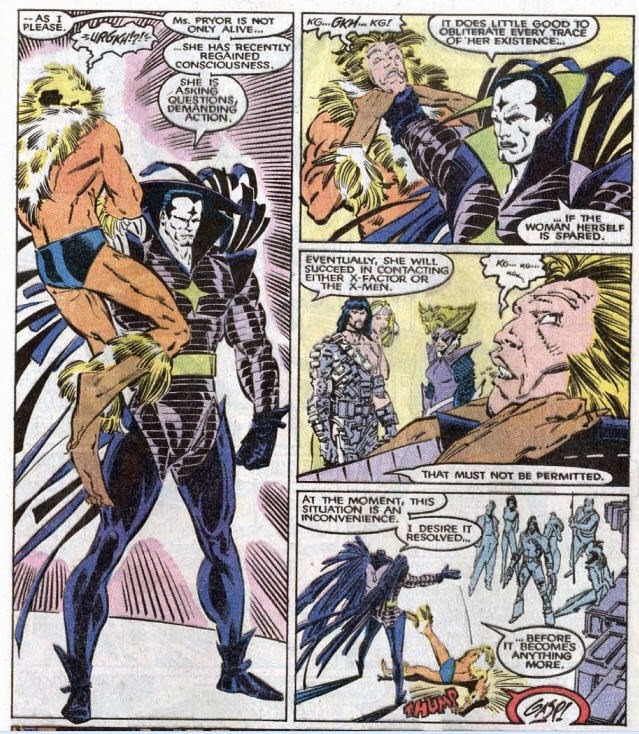 But I would posit that while these issues on first glance provide no scenes that directly suggest just what Claremont’s original intent for Mister Sinister was, when considered with scenes he had seeded outside of this particular story the hints have been RIGHT THERE… and yet none of us saw it, but how in the hell could we have MISSED it? 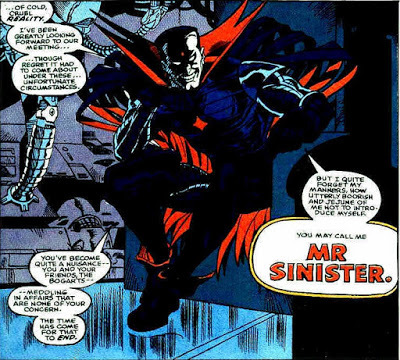 So now it’s just a matter of working out how, if Claremont had remained, his planned origin for Mister Sinister might have played out in-story? 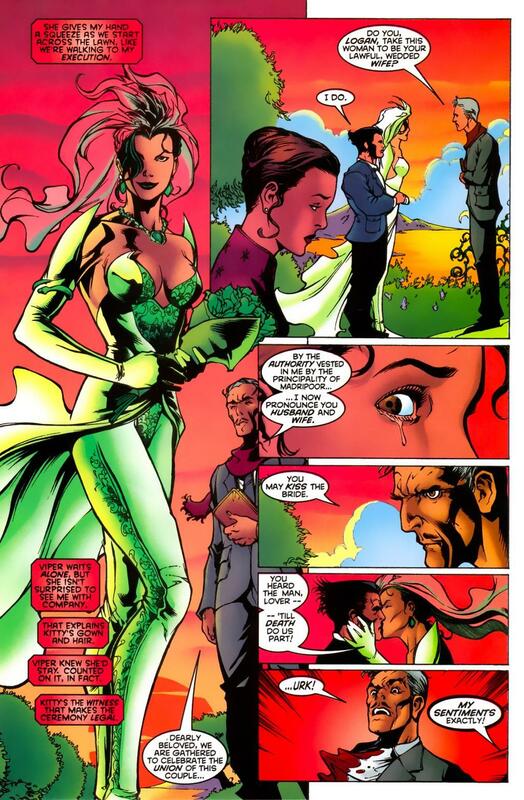 …after his parents were abducted by D’Ken (though why he let Alex be adopted out is a mystery to this day). …since despite his being 50 years of age he knew they wouldn’t take orders from somebody in the body of an 11-year old. With this in mind young Nate had to ensure his agent for interacting with criminals/ supervillains was someone that scared the willies out them. 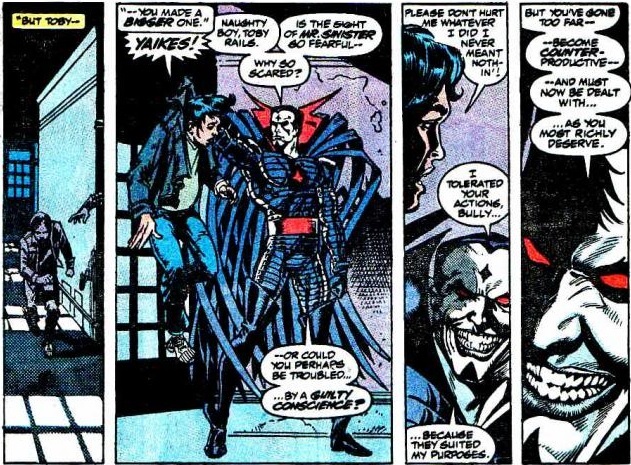 So Mister Sinister’s presence had to be damn creepy, something perfectly achieved by the alabaster skin, jagged teeth and “Uncanny valley”/ “Frank-N-Furter” get-up! As for an appropriate name, he chose one with the gravitas of Doctor Doom! 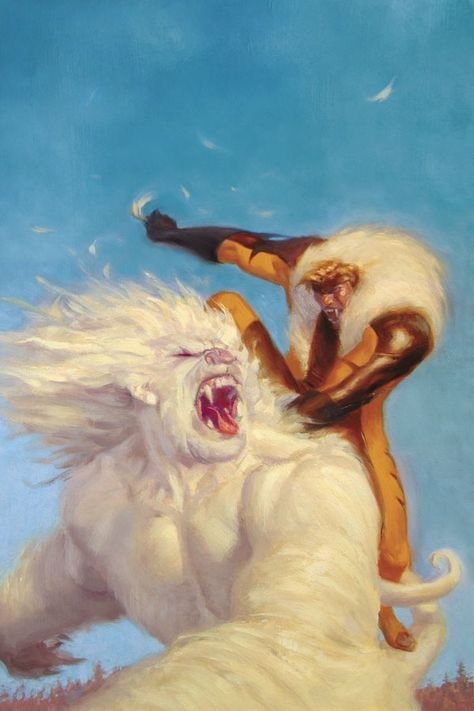 And a form that could physically intimidate even villains like Sabretooth. Well Claremont’s X-Men Forever #7 furthers the earlier hint that young Nate “built” Mister Sinister, showing the supervillain’s body among a group stored away that had been constructed from synthetic materials. 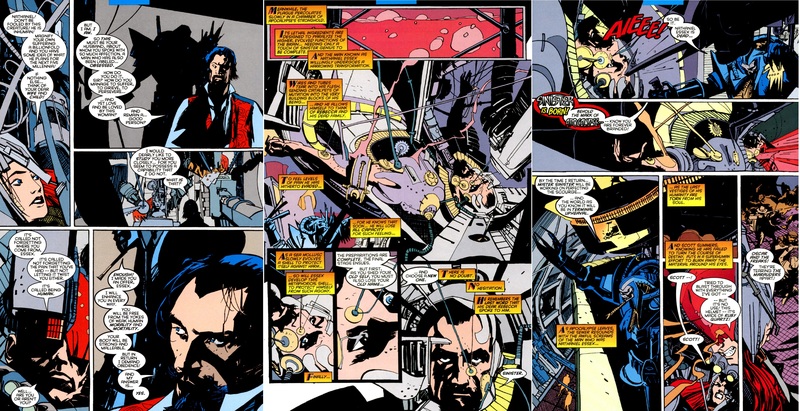 This pretty blatantly suggests Claremont intended Mister Sinister to be an android that young Nate had built. 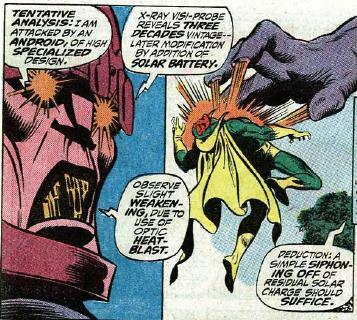 In addition the placement of the red gem on Mister Sinister’s forehead/ sternum seems further inspired by the design of Marvel’s most famous android, the Avenger called Vision whose solar jewel – on his forehead – provided him with the power required to function and manifest a range of energy powers. 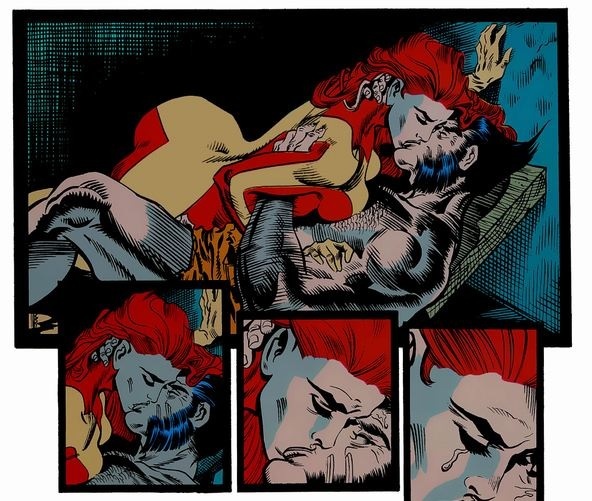 A further clue to Mister Sinister being an android occurs during Claremont’s original run in Uncanny X-Men #241 when Madelyne Pryor, in her guise as the Goblyn Queen, demands Jean Grey’s demonically transformed parents bring her his heart, and he boasts that, regrettably, he has no heart. 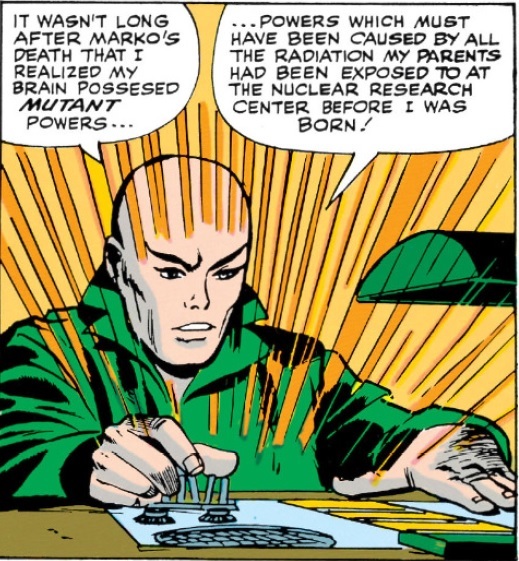 While most would read this to be the boastful claim of a cackling supervillain, I’d suggest in Claremont’s case it was an extremely subtle, veiled reference to the fact he intended him to be a synthezoid, and not an enhanced human. 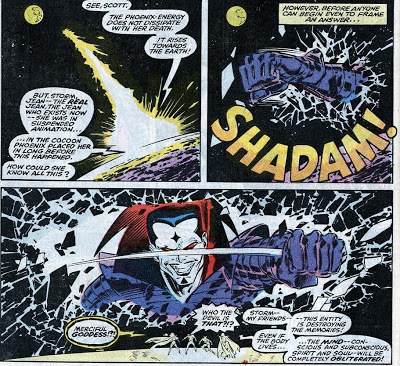 But hold on a minute, Mister Sinister demonstrated a range what appeared to be psionic powers, including the ability to a) take instant control of the minds of other persons, b) establish mental blocks in the minds of others thereby preventing them from striking against him, and c) to project his mind onto the astral plane! 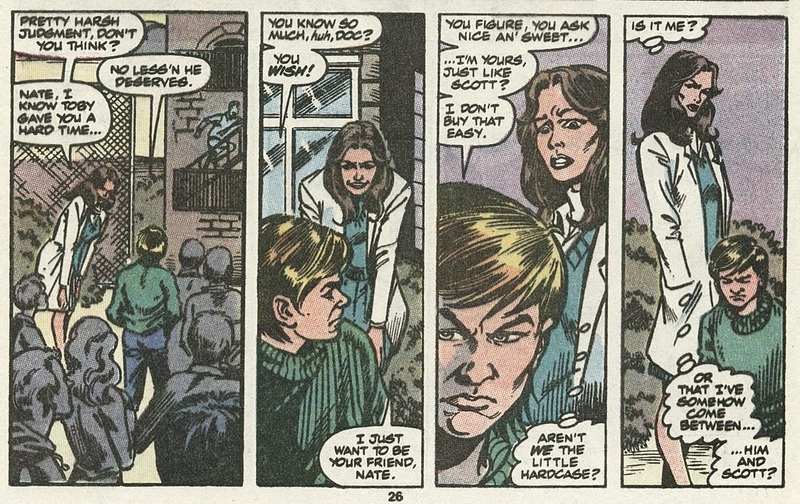 Well yes he did and I’ll get to this further below, but first recall that at the time Claremont introduced Scott’s boyhood friend (Nathan) in the orphanage, mutants only had a primary mutation, not a secondary unrelated mutation, and psionics do not have a connection to retarded ageing which was obviously the mutant ability Claremont intended for young Nate. 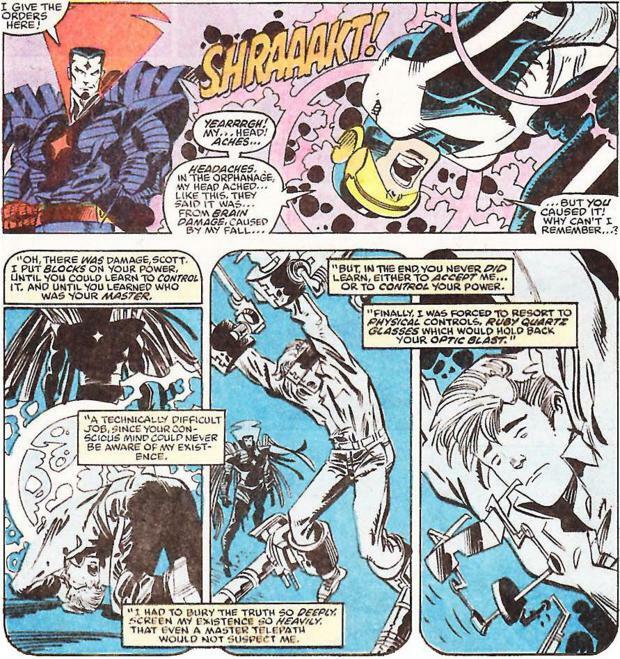 And there is evidence to suggest a range of Mister Sinister’s superhuman abilities are derived from other sources. 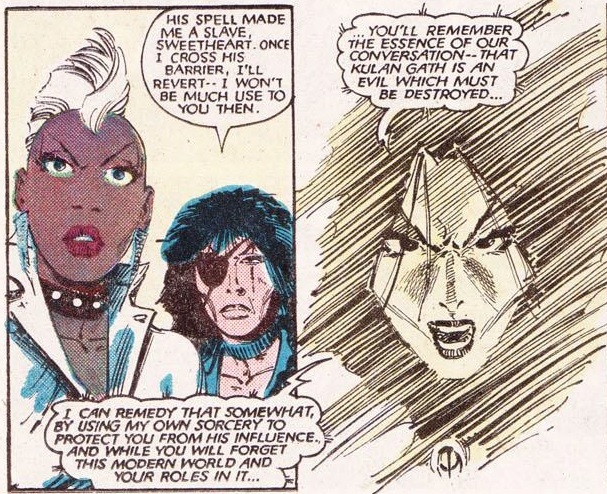 For instance, in X-Factor #39 Louise Simonson maintains Claremont’s idea by having Mister Sinister admit that the job of controlling Scott’s powers in the orphanage were “technically difficult”. This may suggest his ability to take control of other minds is not derived from his mutancy. 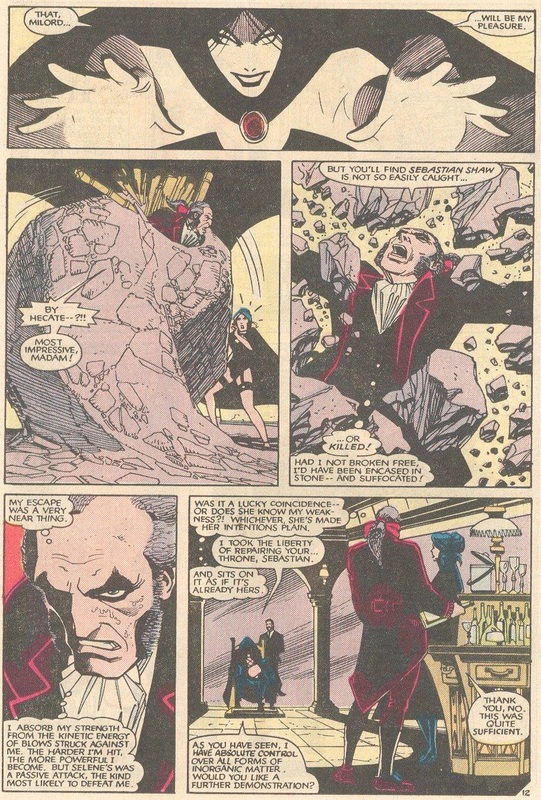 So what if the ruby gem worn by the “Mister Sinister” android does not absorb solar energy to provide the needed power for him to function like the Vision (he lived in the secret high-tech catacombs of the Nebraskan orphanage which was closed off from outside sunlight), but instead absorbed psionic energy from mutants within his vicinity?! Was this perhaps the real reason behind young Nate being intent on keeping Scott around? That is, as Scott’s ability developed young Nate finally had a powerful enough mutant around to fuel the jewel on his android. So did young Nate need Scott in the same way Ahmet Abdol needed his brother Alex? And did he create the Ruby Quartz glasses because he couldn’t have Scott expelling and wasting all that energy; the ruby quartz keeping it contained so young Nate could then absorb it!? Might this then suggest the gem was also composed of ruby quartz!? 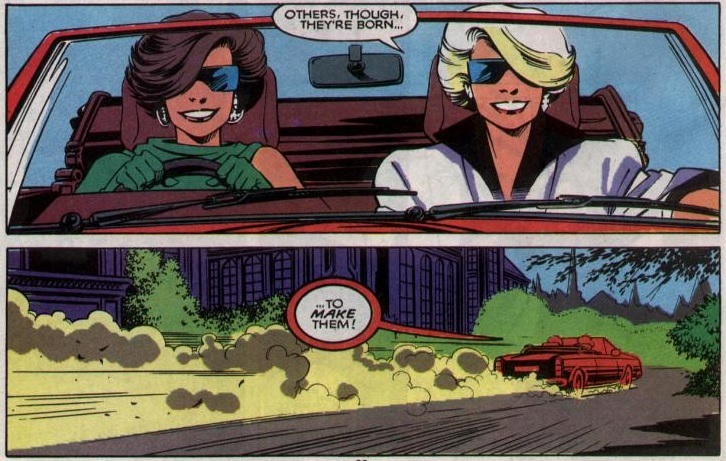 …all the while intent on getting Scott’s powers back somehow. 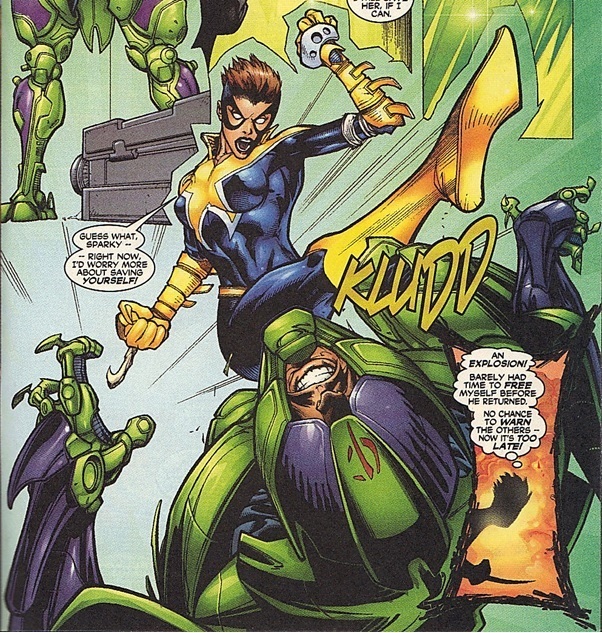 …so he uses Malice in the interim, a mutant of pure psionic energy. 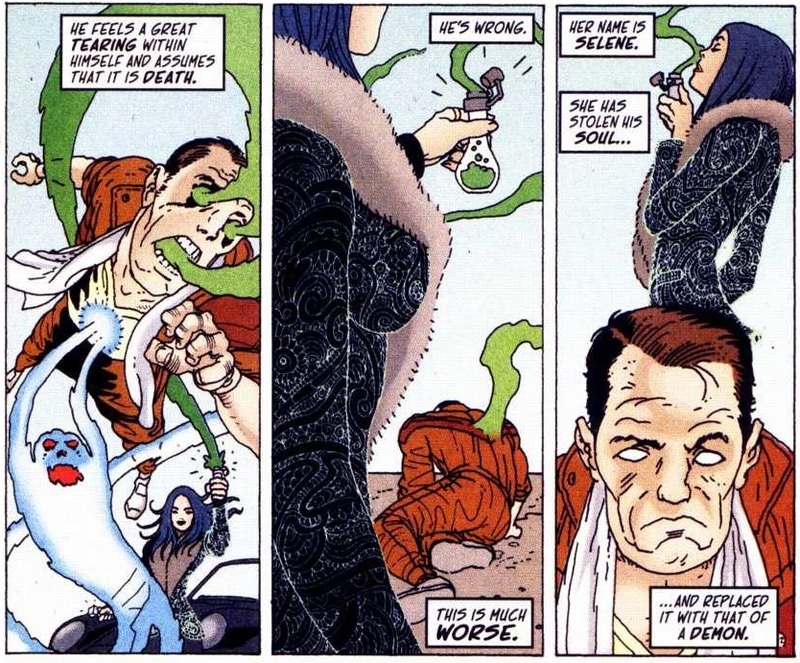 But while Malice is disembodied her energy is dispersed, the same problem he faced with Scott’s release of optic blasts. 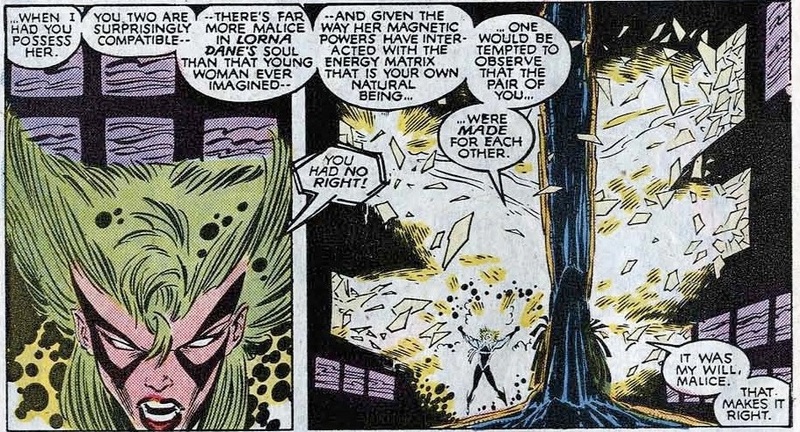 So he convinces her that she requires a host, manipulating her to bond with Lorna Dane, her psionic energy thereby contained and his gem then able to absorb the required amount. 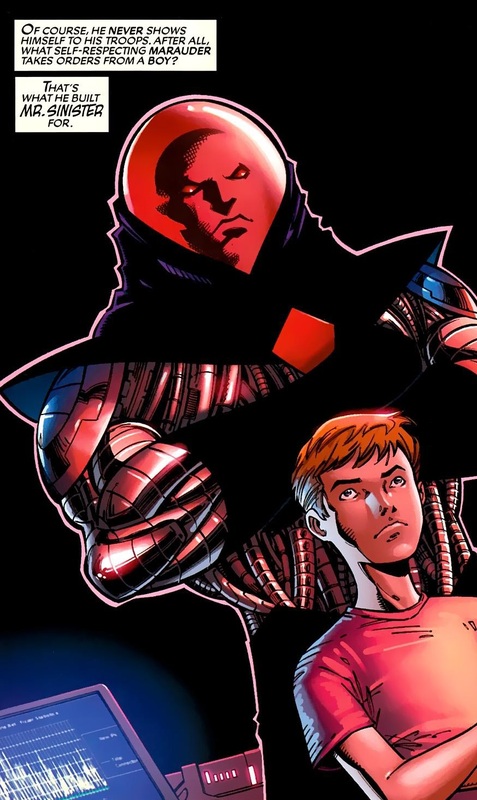 So now the question left is where young Nate procures the “Ruby Gem” that powers his Mister Sinister android? 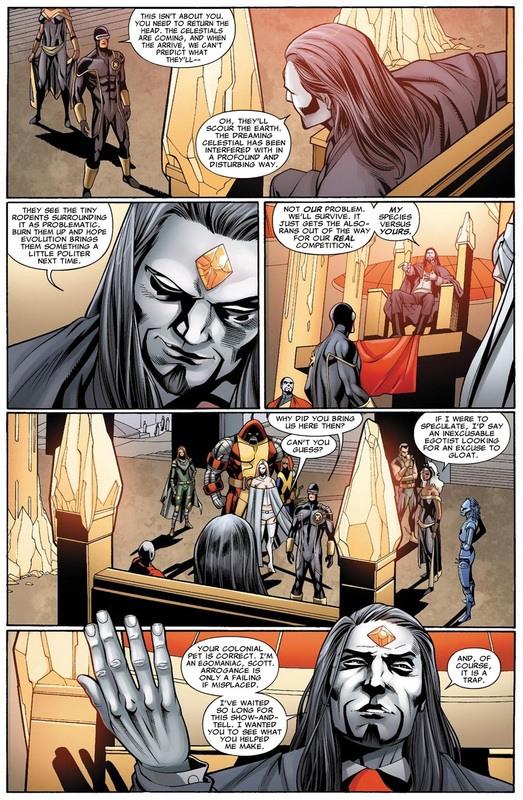 To determine this, I would posit that we need to look back at just what abilities the gem powering Mister Sinister could be enabling him to manifest. 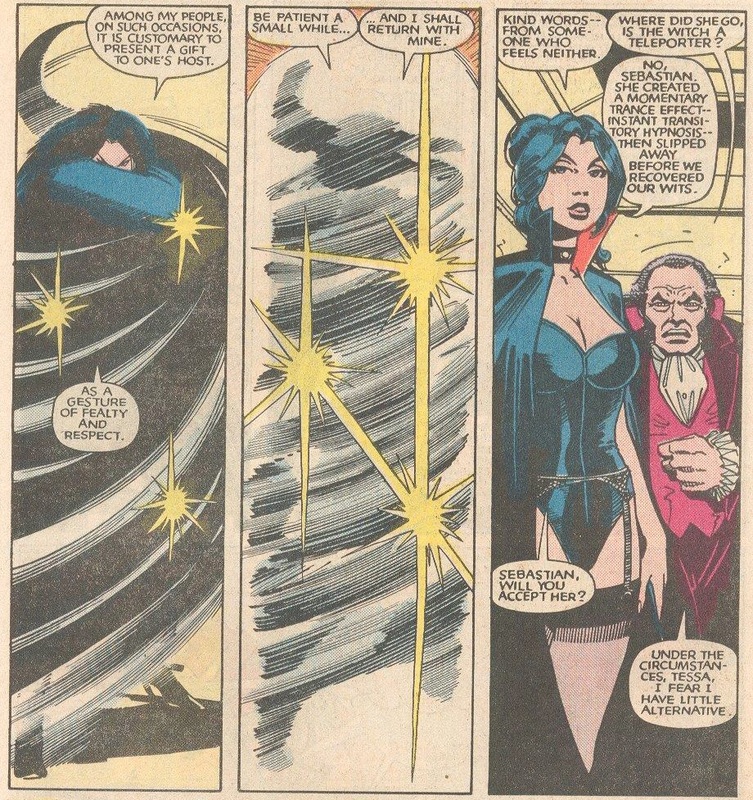 And so I return again to Uncanny X-Men #241 which not only hints that Mister Sinister is a sythezoid, but perhaps also the origin of where his wide range of other superhuman abilities might be derived from. 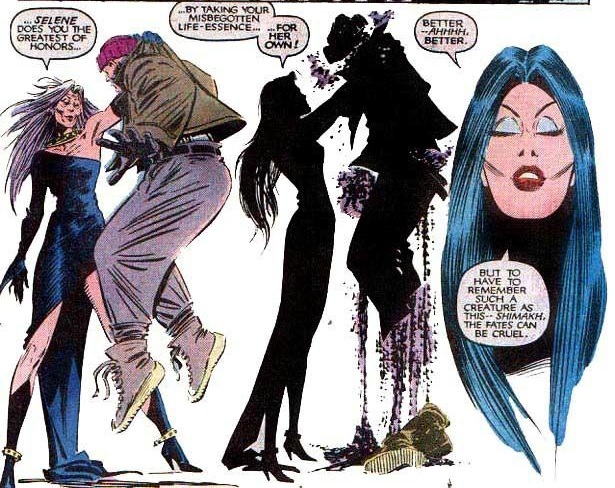 When Madelyne calls him “devil”, he replies “The devil perhaps I am” and while again this could be read as the boastful claim of a cackling supervillain, after he further boasts to Madelyne that he has no heart, he also states that neither is he about to be bested in his own “sanctum sanctorum”. 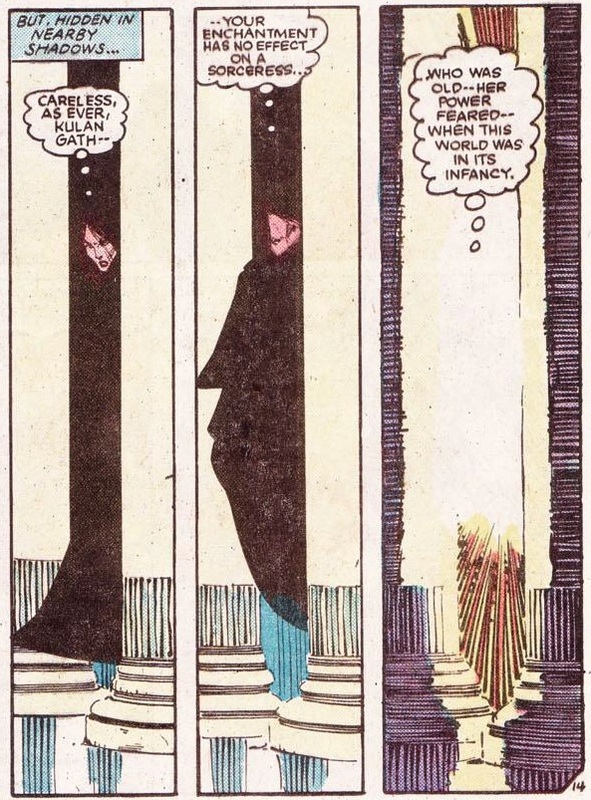 I would posit that when Mister Sinister refers to his secret base as his “sanctum sanctorum”, Claremont is dropping a huge hint. That is, in the Marvel Universe this term only tends to be used by sorcerers when referring to the base from which they conduct their mystical activities (e.g. 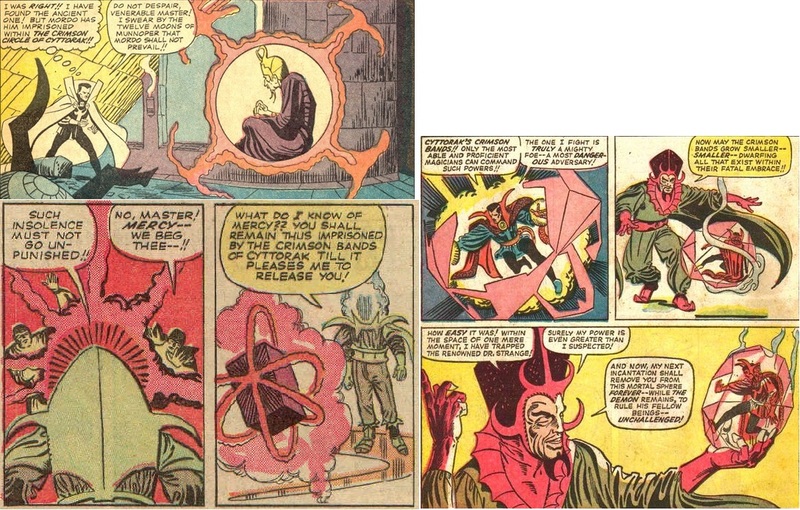 Doctor Strange in Strange Tales #125, Baron Mordo in Strange Tales #132 and even Claremont’s very own Illyana Rasputin in New Mutants #44). 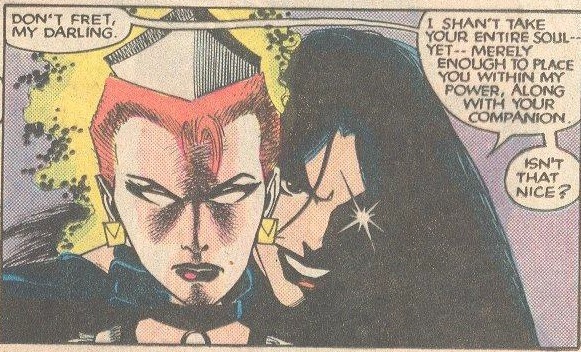 This all appears to be driving the point home that young Nate is akin to another of Claremont’s mutant villains, Selene. 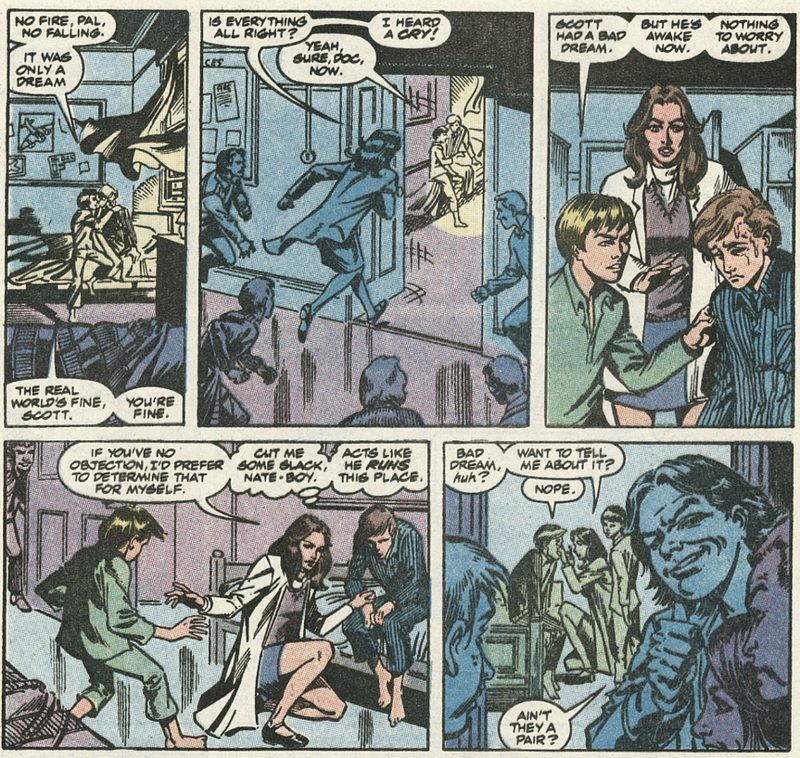 Recall Selene was shown over time to be not only a mutant but a powerful sorceress possessing a wide range of superhuman abilities (the extent of which are outlined by Claremont in the scenes below), it never being clearly defined which of these was her mutant ability and which were skills derived from magic or other sources. 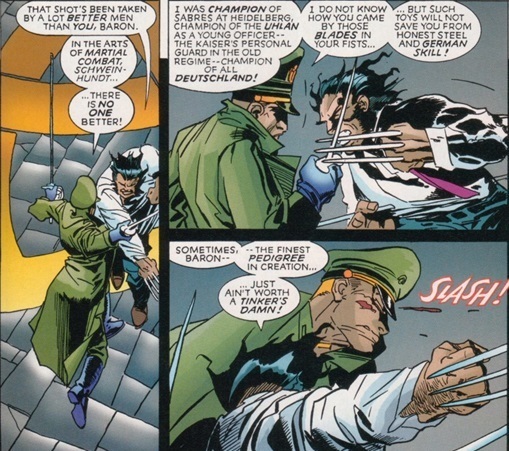 I’d therefore suggest this was the same for young Nate, who possessed the genetic mutation of retarded aging, while the wide range of superhuman abilities Mister Sinister showed were skills derived from the ruby gem he wore. 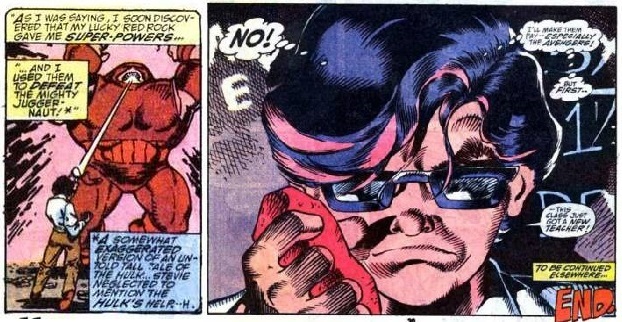 And the ruby gem powering young Nate’s “Mister Sinister” android enabled him to access a range of mystical abilities. 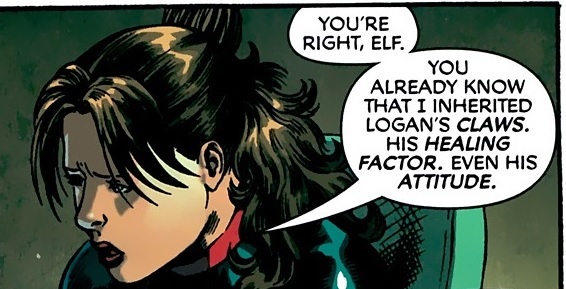 As further evidence of this, Uncanny X-Men #241 provides even more hints. 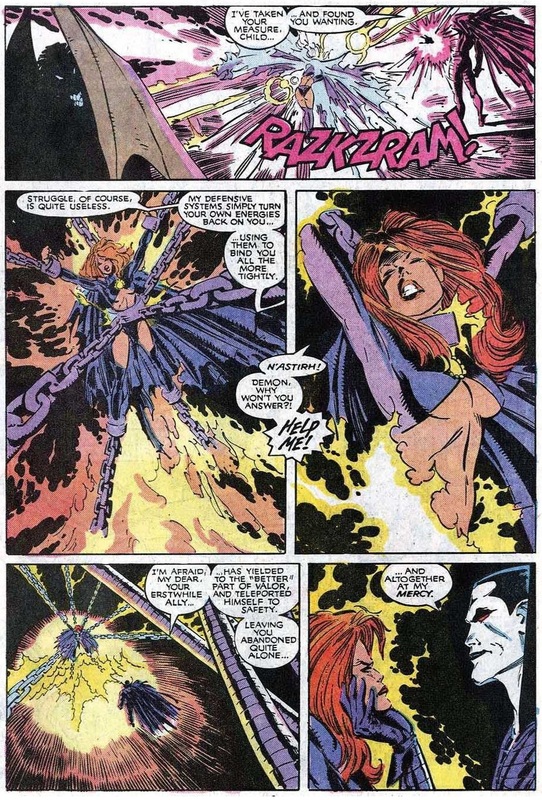 That is, in this issue Mister Sinister casts energy at Madelyne which results in her being bound by chains around her legs, arms, waist and neck, and engulfed in flames. He tells her that her struggle is useless, explaining that his defensive systems simply turns her energy back on her, using them to bind her all the more tightly. 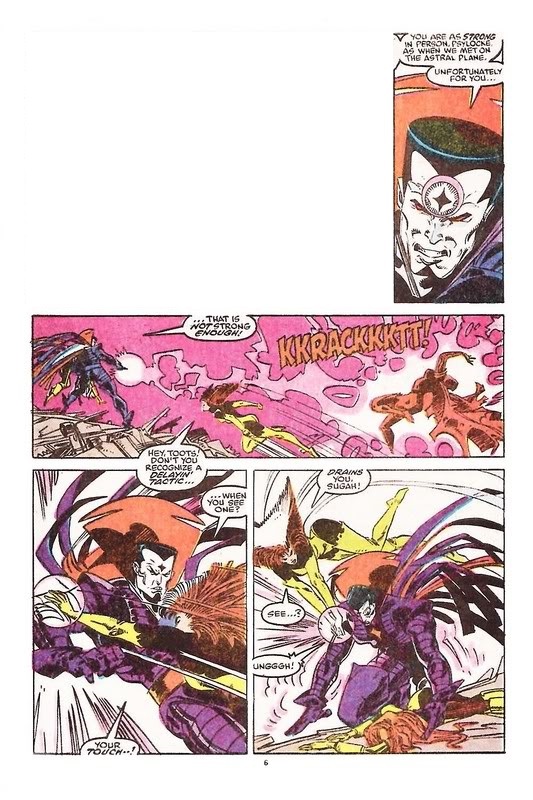 Even her ally, the demon N’astirh abandons her and teleports himself to safety when he sees Mister Sinister begin cutting loose with his powers. 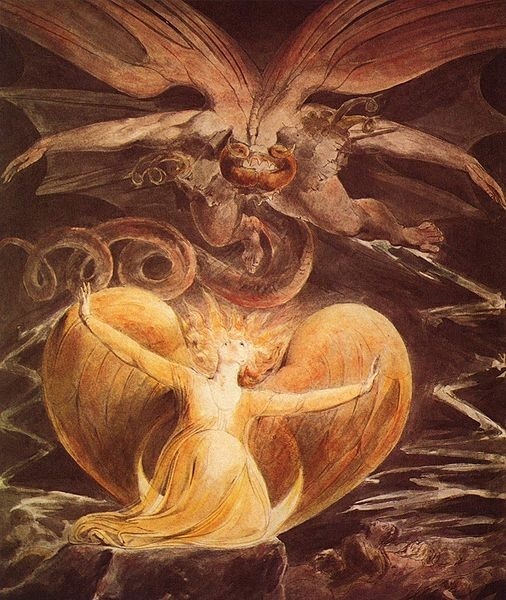 The only reason a demon of N’astirh’s level would flee would surely be because he realised he was in the presence of a sorcerer more powerful than himself. 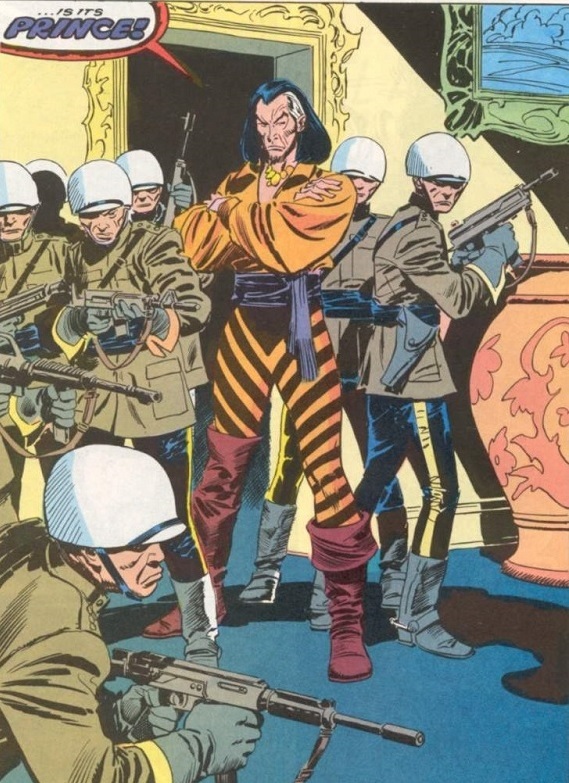 But aren’t mystical villains left to the mystical corners of the Marvel Universe (i.e. Doctor Strange) and not the X-titles you ask! 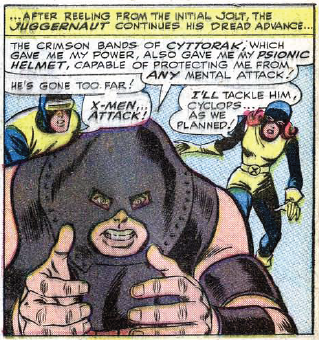 Well, leaving aside the Margali Szardos, Belasco, Kulan Gath, Selene and the Adversary, there is precedent as far back Stan Lee & Jack Kirby’s X-Men #12 which introduced Cain Marko who became transformed into Juggernaut, the human avatar of the mystical entity/ demon Cyttorak, by the Ruby Gem of Cyttorak which empowered him with the power of the crimson bands of Cyttorak. 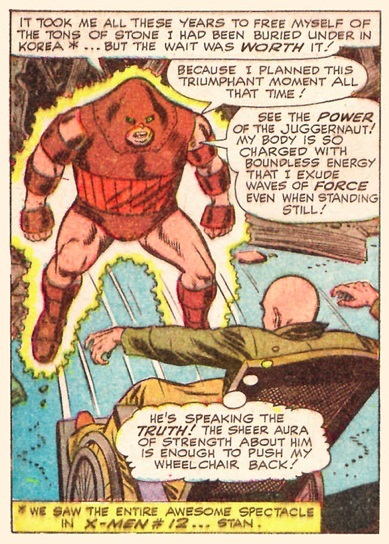 Juggernaut was always an odd concept to introduce into a title about mutants, what with his creator, Cyttorak, being a character more at home in the corner of Doctor Strange. 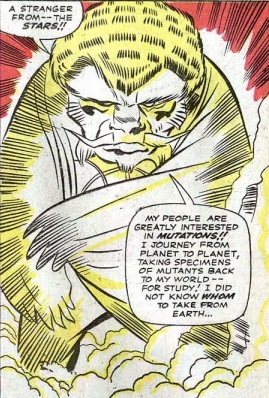 However, I always wondered whether there might have been a plan by Kirby to reveal Cyttorak as somehow connected to the mutant world; after all he did provide Cain with a “psionic helmet” capable of protecting him from any telepathic attack!? 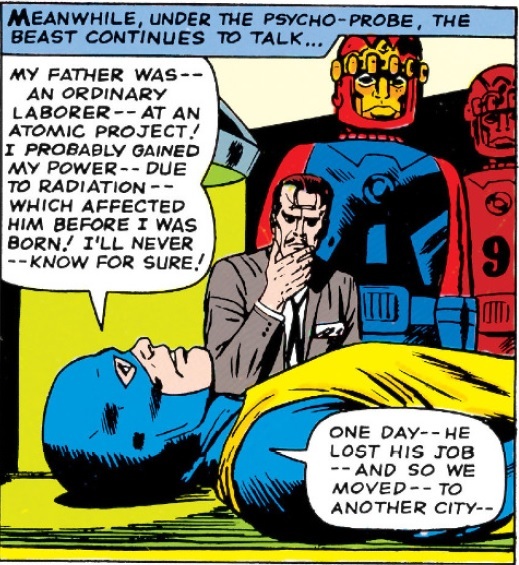 …and Beast had a similar theory when he explained his father was an ordinary labourer at an atomic project (cf. 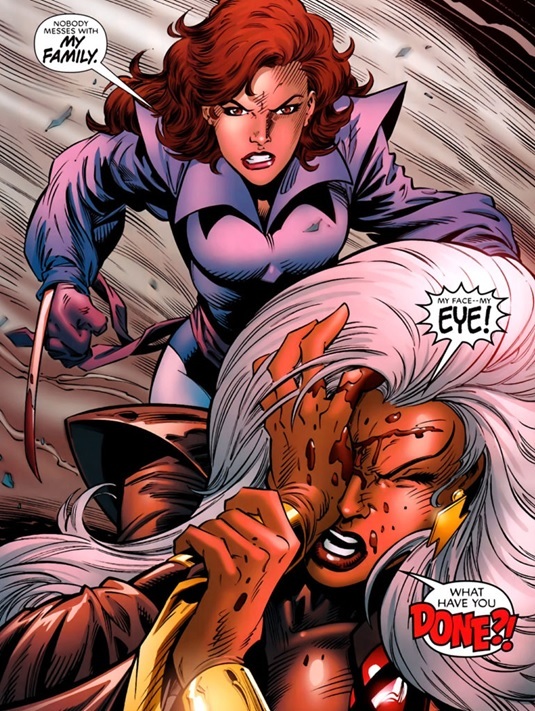 Uncanny X-Men #15). 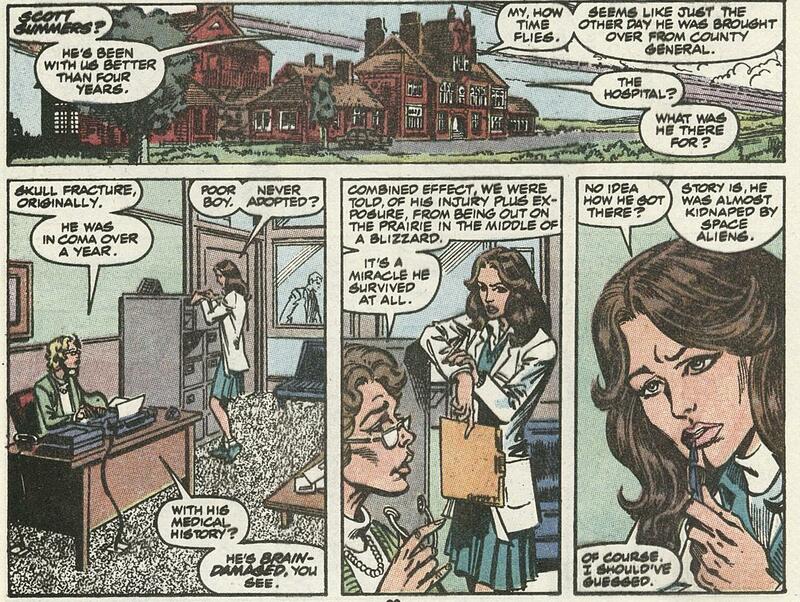 However, was that meant to be the bland origin but as time went on it would be revealed that mutant powers had a much greater history, one that would lead to a huge destiny in the MU (akin to that hinted at by Claremont in Uncanny X-Men Annual #11)? 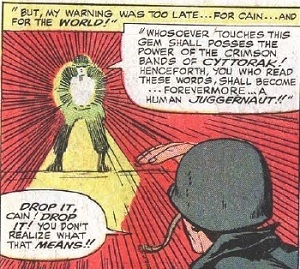 Could the introduction of Juggernaut have been intended as the first major hint that put into question the Atomic Age as behind the origin of mutant powers? Recall just the issue before the Stranger appears on Earth to study mutants saying his people are greatly interested in their emergence. This issue it is also revealed that there are mutants on other planets; and whereas the Collector has a wider-brief for his collection obsession, the Stranger says his people primarily focus their interest on collecting mutants from planet to planet. 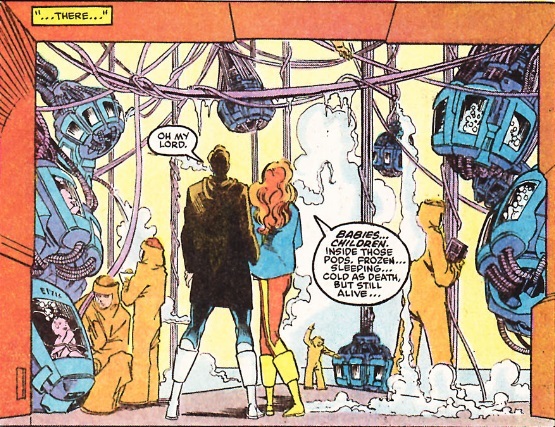 Yet we’ve not really had mutants introduced from other worlds in the MU (except perhaps Warlock from the Technarch). 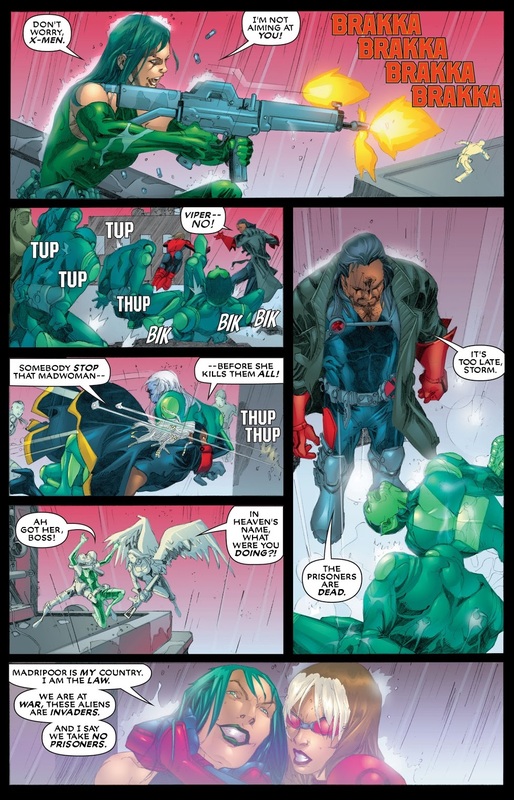 So could the Stranger’s introduction have been the start of an eventual story to reveal a longer history of mutancy, and the Juggernaut was the first example of dimensions beyond ours establishing protocols to defend their realms from the threat of mutants (so in essence Juggernaut was a Sentinel of the mystical dimensions)? Perhaps if Kirby had stayed on this could have been the direction they headed in!? What I like about this is it makes what previously appeared as non-mutant characters like the Stranger and Juggernaut having a legitimate reason for appearing in the title by properly tying them directly into the mutant mythology. 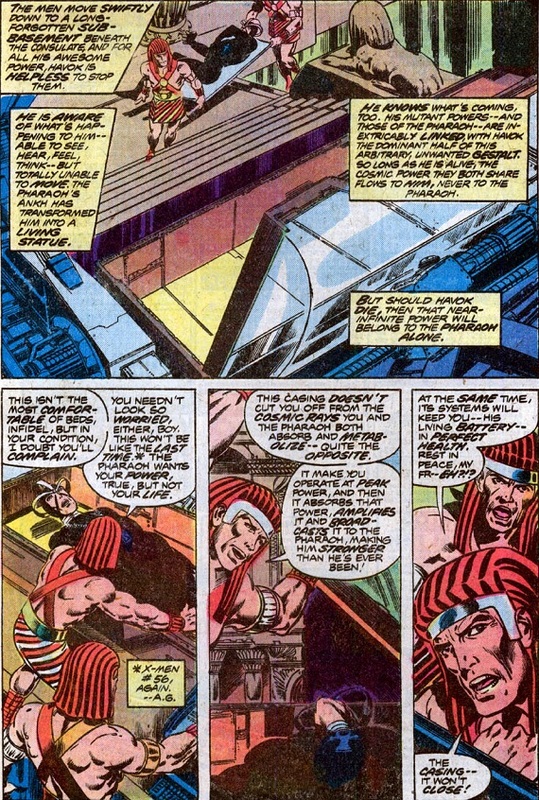 …and Claremont had picked up on this, and therefore intended the gem that powered the “Mister Sinister” android to be a fragment of the Ruby Gem of Cyttorak, and N’astirh fled his “sanctum sanctorum” upon seeing a demonstration of his powers because he recognised it as the power of the crimson bands of Cyttorak? 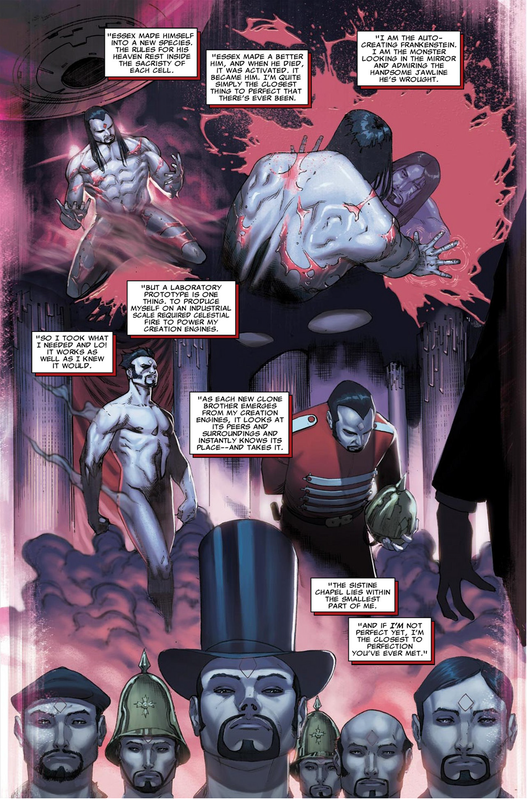 If the ruby gem which powers the “Mister Sinister” android is a fragment of it, this would seem to suggest his abilities are all applications of the crimson bands of Cyttorak. To answer that question we need to go back to the Marvel Universe’s definition of them. 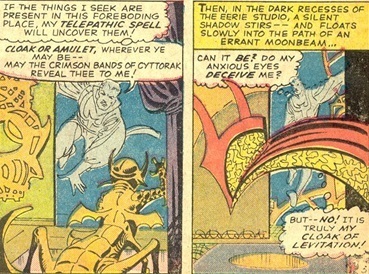 …then Doctor Strange called on them to reveal where his Cloak of Levitation and amulet, the Eye of Agamotto, had been hidden (cf. Strange Tales #143). This alternate use for the crimson bands has never been resolved, and seems inconsistent with its earlier applications. But might the answer lie by looking more closely at the superhuman abilities Mister Sinister put into application! 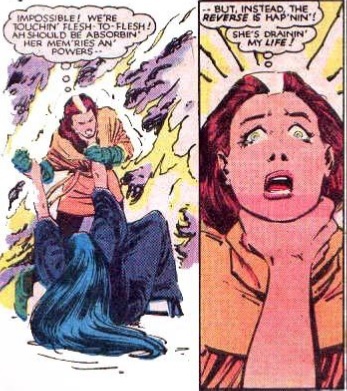 In Uncanny X-Men #243, the epilogue to Inferno, Jean begins experiencing a psychic attack after integrating the Pryor clone’s memories, putting up a telekinetic barrier around herself to protect the rest of the team in fear that it might be Madelyne intent to use her powers to cut loose against them. 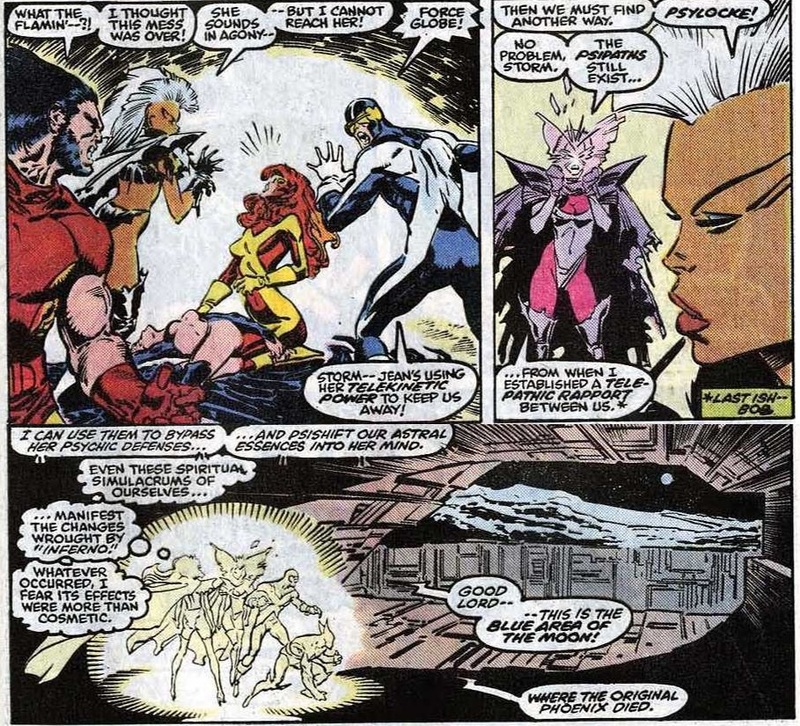 To break through Jean’s telekinetic barrier so they can help her, Psylocke forms a bond with Cyclops, Wolverine and Storm to psi-shift their astral selves inside her mind. 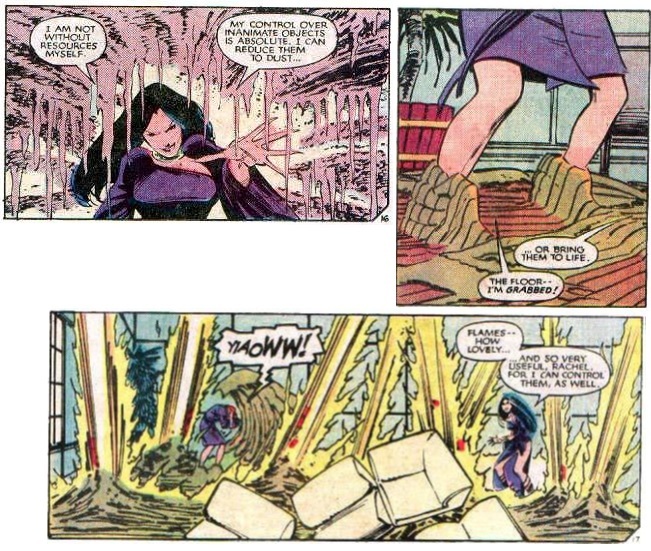 While they are observing her mindscape, finally getting close to pulling back the veil of Madelyne’s origin, Mister Sinister’s fist shatters through the mindscape and begins shattering one memory shard after another. 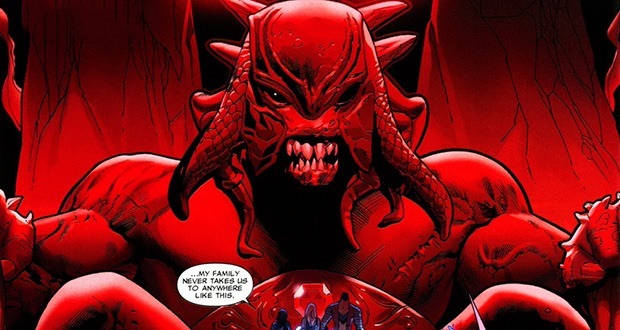 While this might not seem connected to Cyttorak’s power at all, recall the Crimson Bands bind because they are unbreakable! 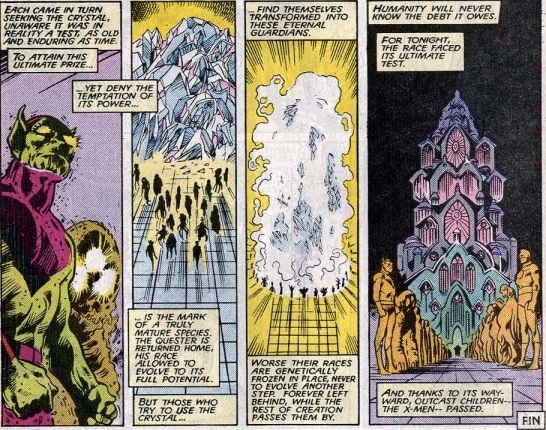 And given they’re unbreakable, this is likely how the power of the Crimson Bands, granted to Cain Marko by Cyttorak’s gem, transform him into an unstoppable physical force (since whatever he motions against effectively “shatters”). So does this firstly explain how Doctor Strange was able to call on the Crimson Bands of Cyttorak to reveal where his cloak and amulet were in Strange Tales #143? That is, if you extend “unstoppable force” to a person’s willpower, then was Doctor Strange able to find out where his cloak and amulet by calling on the Crimson Bands to empower his will so he could break through the spell concealing them? It would seem “Most likely”! 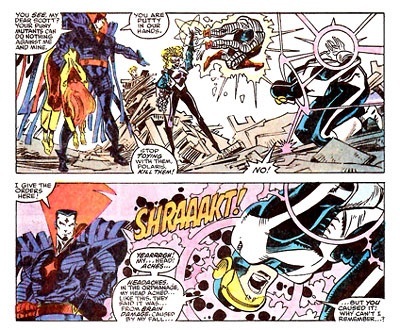 Now onto how the source of Mister Sinister’s wide range of superhuman abilities are derived entirely from the Ruby of Cyttorak, I would further suggest that when the ANDROID is able to launch what would appear to be a psychic attack on Jean, and start shattering her memories, is not the result of young Nate possessing any mutant telepathic ability, but rather the ruby gem powering Mister Sinister android with the Crimson Bands of Cyttorak which enable the android to “exude waves of force” to break through psionic shields. I would further posit evidence to support that the psionic powers are not possessed by young Nate, but that he instead requires the “Mister Sinister” android to exert control over the minds of others on his behalf comes in Classic X-Men #41, when another boy at the orphanage, Toby Rails, upon beating up Nate and teasing him, suddenly finds himself in the clutches of Mister Sinister when heading back to his room. 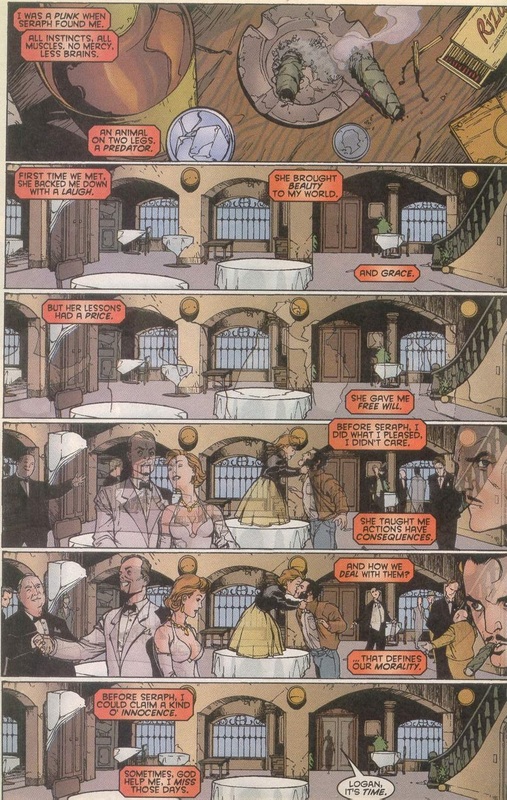 Sinister gloats that he “must now be dealt with… as he most richly deserves”, and the following day Rails, not seeming in control of his faculties, makes his way to the orphanage roof and jumps off, falling to his death. 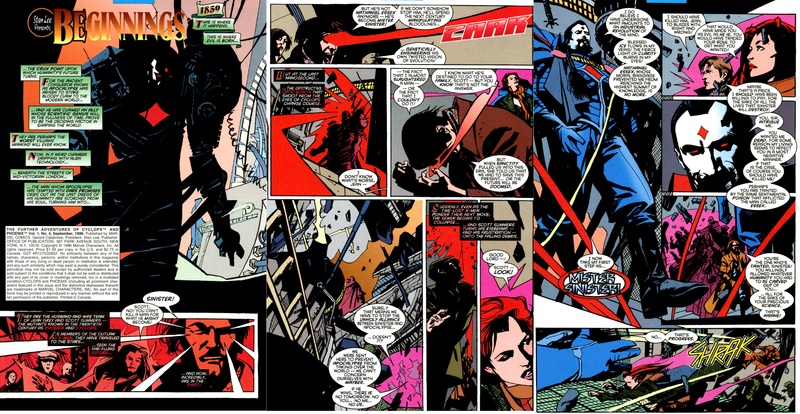 If all of the above hasn’t yet caused you to face fully front true believer, compare the signature energy colour of Mister Sinister’s power, on display during Inferno below (particularly the last panel scene where he releases energy which forms as bonds, tying Cyclops’ hands behind his back from X-Factor #39), with that of the “crimson bands” on display in Strange Tales #124, 126 and 128 above. 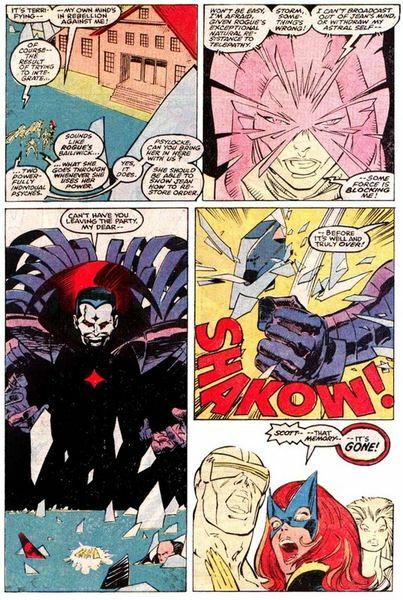 So the truth behind Mister Sinister is that he is not a mutant, but rather a synthezoid built by a young mutant; and powered by the Ruby Gem which provide him with a wide range of superhuman abilities derived from the Crimson Bands of Cyttorak. 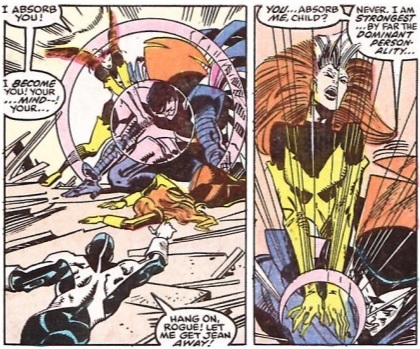 As for Mister Sinister’s motives cloning Jean Grey; and then manipulating events so this clone would become his “brood mare” and seek out and conceive a child with Scott Summers, might this suggest that Cyttorak wanted control of the Phoenix power. Earlier in Uncanny X-Men #239 “Mister Sinister” claims that young Nathan Christopher Summers will help him win a long-range game. Is this game perhaps with other mutant sorcerers, including Selene, and being run by Cyttorak in a bid for supremacy of the higher dimensions? And of course just as Claremont suggested, in his Seriejournalen.dk interview with Ulrik Kristiansen and Tue Sǿrenson in 1996, the story of a young boy using the Ruby of Cyttorak to animate superhuman clones and manipulate heroes into battle with them was rejected and suddenly came up a few years later, starting with Avengers West Coast #64 where a young boy, Stevie, found the gem and gained various mystical powers without becoming the Juggernaut. Post-script: The question remaining is where a child scientific genius with expertise in the fields of cloning and robotics acquired the knowledge to build a highly-advanced android. Could he have inherited his scientific genius from a parent… and if so, which one? 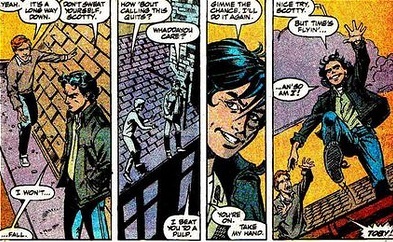 By Claremont’s estimates young Nate had been alive since the mid-20th Century so it would need to be one who was old enough to conceive around that time. Acknowledgements: Thanks go out once again to fnord12 of the Marvel Comics Chronology and the Ancient One of Alvaro’s Comic Book Message Boards for tracking down some hard to obtain images and last of all Kirby historian, Richard Bensam (of Estoreal) for being a patient sounding board on my Juggernaut as “Cyttorak’s protocol against psionic mutants” idea.